During the Cold War, the number of different tank types the Soviet Union maintained often puzzled Western analysts. Eight distinct families of tanks were operated, supported, and modernized simultaneously — the PT-76, T-10, T-54, T-55, T-62, T-64, T-72 and T-80. The end of the Soviet Union appeared to signal the demise of the philosophy of multiple tank lines. Following the debacle that was the T-80 in Grozny, the T-90 and T-72 were the only tanks that appeared to be receiving significant attention from the military — T-80Us and T-80UEs were only refit and modernized in small numbers. This appeared to be a cost saving measure, as both are produced and supported at the Uralvagonzavod tank plant. However, the reemergence of the T-80 series in the T-80BVM along with the continued development of the T-72 and T-90 predicate a return to the operation and development of multiple types of tanks for the Russian Federation. But how do these tanks differ? Do some tanks provide significant advantages over others? Most recent attention has been focused on the T-72 tank line in Russian service. The appearance of T-72B3s in Ukraine has cemented attention on it as the new premier main battle tank in Russian service. Indeed, the T-72B3 is slated to be the frontline MBT in Russian service until the Armata is produced in significant numbers. Overall, the T-72B3 is an upgrade in capabilities from the T-72B and T-72BA variants it will be replacing. A new engine increases its tactical mobility. Improved Relikt explosive reactive armor increases the protection against all threats. The addition of the Sosna-U thermal gunner sight — in tandem to the regular 1A40-4 sighting complex — improves the ability of the T-72B3 to detect targets and fight in adverse environmental conditions. The main 2A46 gun has been updated to fire newer rounds. The T-72B3M, a further update of the T-72B3 adds in the PK-PAN thermal commander sight, which allows the commander to independently search for targets, and then slew the turret to engage them (hunter-killer ability). As this is a fairly commonplace capability on Western tanks—called the Commander’s Independent Thermal Viewer (CITV) on the American M1A2, and the PERI-R17A2 on the Leopard 2A5 — this brings the observation and situational awareness capabilities of the T-72B3M to rough parity with Western vehicles. 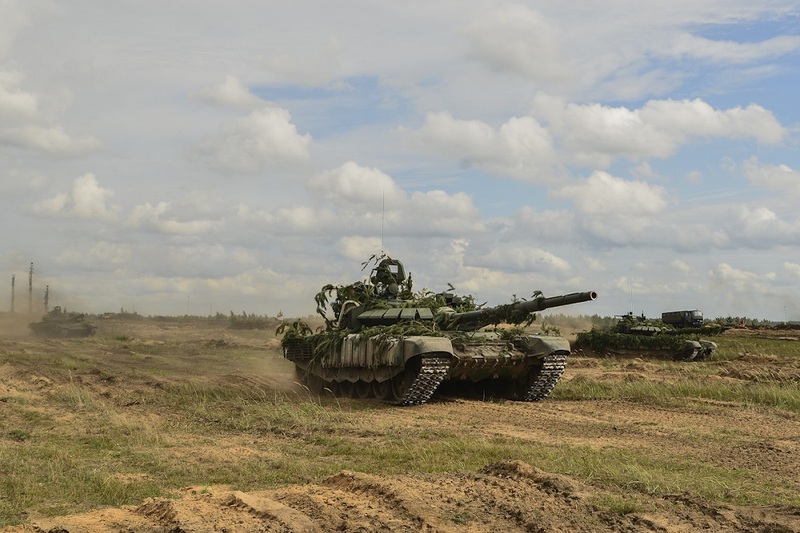 The T-80 tank line is also receiving modernizations. The T-80BVM is the most modern variant of the T-80. It too features a Sosna-U, however, it does not retain the traditional 1G42 optical sight. Rather, the Sosna-U takes the role of the primary gunner sight. The backup PDT sight is less capable, lacking the advanced target lead and GLATGM — gun-launched anti-tank guided missile — guidance capability of the Sosna and 1A40-4 sights. This gives the T-80BVM less systems redundancy compared to the T-72B3, but the T-80BVM is more ergonomic. Due to the Sosna-U being the primary gunner sight, it is directly in front of the gunner station in the tank. On the T-72B3, it is off to the side, making rapid utilization more difficult and prolonged use more discomforting. Higher-res T-90M & T-80BVM side & T-90M frontal view. The T-80 receives similar upgrades in other aspects to the T-72B3. However, it retains the traditional strength of the T-80 series, the gas turbine engine — producing greater horsepower than the T-72B3 and giving the T-80BVM a greater horsepower-to-ton ratio. The engine also has better performance in arctic conditions, starting in temperatures as low as 40 degrees Celsius. With regards to protection, the T-80BVM uses Relikt ERA, putting the protection roughly on par with the T-72B3. The layout of the Relikt armor seems to be a rough equal of that on the T-72B3, with a V shaped ring of plates around the turret. The T-80BVM overall is a roughly comparable tank to the T-72B3, with better tactical mobility. However, it lacks the advanced independent commander thermal sight capability present on the T-72B3M. The T-90M “Breakthrough-3” is the third MBT in development. In January 2017 it was reported that all T-90 tanks in Russian service will undergo this modernization. These tanks are receiving deeper modernizations than the T-72B3, with the new 2A82 gun slated to be installed — the current T-90M, T-72B3 and T-80BVM use modernized versions of the original 2A46 gun used on the original designs. The new gun allows for the use of longer rounds, increasing the possible penetration of each shot. The caliber remains the same — 125 millimeters — and allows for compatibility with legacy ammunition for other types of rounds. The T-90M includes an independent commander’s thermal sight for hunter-killer capability. A thermal gunner’s sight is also included, however reports conflict as to the models, with some saying that the sight will be the Irbis-K gunner’s thermal sight with all-Russian internal components. On the other hand, others have pointed out that the T-90Ms on display have only been fitted with the Sosna-U gunner sight and PK PAN commander sight, both of which still include French components. The Irbis sight has been cleared for production, so it could appear on the T-90M later in production. The T-90M is slated to be fit with the improved Malachit ERA, which provides increased production relative to the Relikt ERA present on the T-72B3 and T-80BVM. There are further plans to equip the T-90M with the Afghanit APS. However, there have been no photos of T-90M with Afghanit or Malachit.